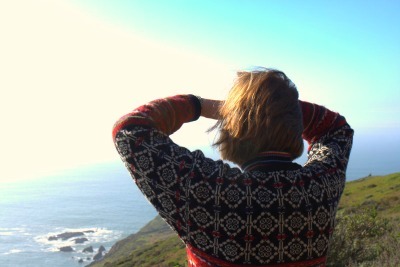 Rodeo Beach is one of my favorite places to take out-of-town guests. It's a great place to go if you enjoy spending time outdoors, whether you are an active type or you just like a pretty place to soak in some natural scenery. 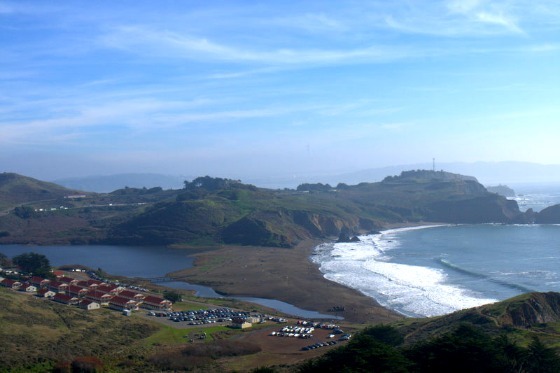 Tucked within the Marin Headlands, just north of the Golden Gate Bridge, it's a beautiful spot where you can hike, surf, picnic or keep an eye out for one of the many species of birds that calls this place home. Another plus is that it's not on the "must-do" list for most tourists visiting San Francisco, so it's never that crowded. The image of the beach below was taken on a "busy", sunny Sunday. Parking is easy (and free! ), and there are wheelchair-accessible restrooms, as well as a picnic area. There is also an historic military base, Fort Kronkite, located right next to the beach. Whenever I come here I imagine how fortunate the men stationed here were to be in such a peaceful, lovely area. A beach break at the far end of the beach is popular among surfers, although the waves are not suitable for beginners. Swimming is not safe as the currents are strong, and there can be occasional "sleeper waves" - a large set of waves that seems to come out of nowhere. You are allowed to bring dogs to Rodeo Beach, although they must remain leashed at all times, and they (nor people!) are allowed to swim in the lagoon. This is to protect the birds' habitat, as well as not frighten the ones who have made this place their home. Restrooms are located close to the parking lot at the far end of the beach. The hiking trails around Rodeo Beach offer amazing views of the Pacific coastline and surrounding headlands, and on a clear day you can see the San Francisco city skyline from the upper headland peaks. 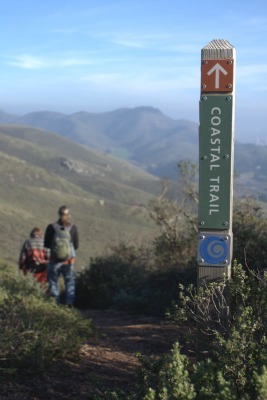 There are several possible hikes that you can do, but the most common one is a 4.5 mile loop made up of the Coastal Trail, the Wolf Ridge Trail and the Miwok Trail. It can be hiked in either direction, although it's easy to start at the Coastal Trail entrance since it is located at the north end of the parking lot. Of course you can do shorter versions of the hike by walking a section of it, and then turning around and walking back in the same direction that you came, or you can also follow the meandering pathways along the coastal cliffs on either side of Rodeo Beach. Both are rewarding options. 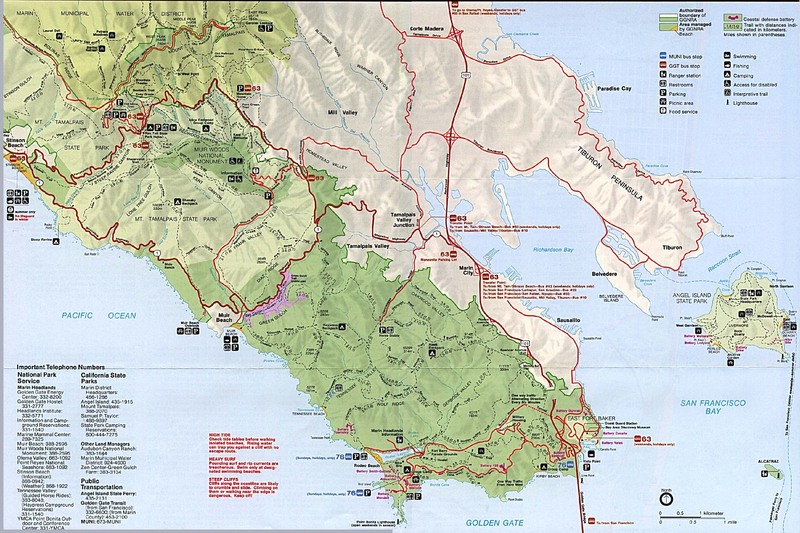 For a map of trails around the Rodeo Beach and the Marin Headlands, click here. Marin Headlands Visitor Center for trail maps and advice. 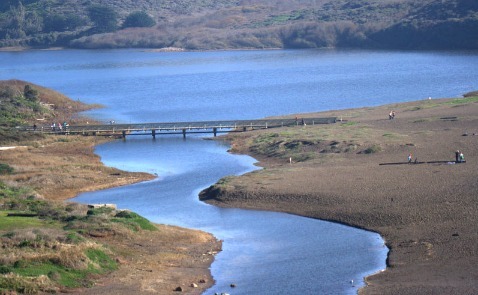 There are a wide variety of birds that make Rodeo lagoon (an ever changing mix of fresh- and salt-water) their home, as well as several species that pass through on their way north or south. Just a few examples of what you might see are pelicans, hawks, gulls, herons, ducks, terns, willits, loons, grebes, scoters, sanderlings or sandpipers! As a huge fan of pelicans, I love the close-up view that the coastal trails surrounding Rodeo Lagoon offer of them. 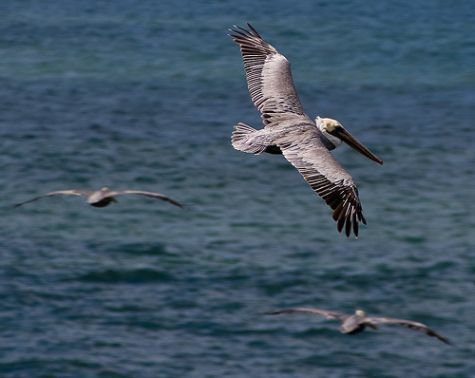 You can frequently see the endangered-species Brown Pelican flying gracefully along the Marin Headland cliffs. 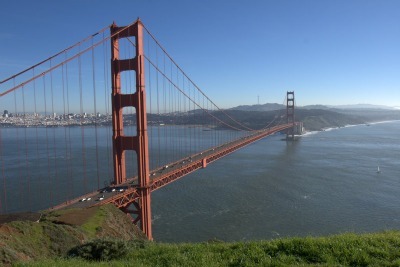 There are a few different ways that you can get there, but the route that I describe here is the most scenic one, offering stunning views of the Golden Gate Bridge, San Francisco city skyline and Pacific Ocean that never fail to impress. On Sundays and holidays, SF Muni line #76 services a bus stop right next to Rodeo Beach. 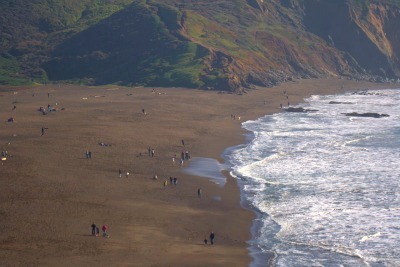 If you are planning a trip to the Golden Gate Bridge, consider combining a visit there with a trip to Rodeo Beach. The two attractions are easily seen together, and as you'll see below, there are great photo opportunities of the bridge along the way to Rodeo Beach! Click here for Google maps, but be aware that if you request directions through them, they won't give you the scenic route! 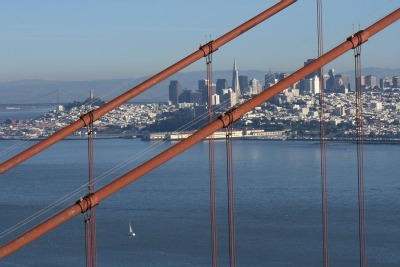 Presuming that you are coming from within the city, make your way to the Golden Gate Bridge. Cross the bridge and keep your eye out for exit 442 for Alexander Ave. It will be the 2nd exit after you have crossed the bridge, and shortly after the North Vista Point exit. After exiting, keep left at the fork, and at the stop sign, turn left onto Alexander Avenue. Travel 0.2 miles, and then make a sharp, steep right onto Conzelman Road. You will wind up the hill on Conzelman Road for the next 4 miles. About 200 feet up Conzelman road there is a lookout that offers excellent views of the Golden Gate Bridge and city skyline. You will see people parking their vehicles on the left side of the road to take advantage of the great views. Feel free to pullover and do the same! The two images below are taken from the lookout point! If it is crowded and you don't want to battle for parking, continue up Conzelman Road as there will be other pullout areas where you can park your car and step out to take a look. When you reach the top of the hill, at the end of Conzelman road, you will make a right at Fort Barry, travel 0.1 miles, and then continue onto Field Road. You will pass the Marin Headlands Visitor Center on your left. Feel free to stop in for information about the surrounding area, otherwise, make a slight left at the fork just after the center, and continue on to Bunker Road. Bunker Road will wrap around Rodeo Lagoon, and you will want to continue straight at the fork on Mitchell Road. By the time that you are on Mitchell Road you will see the beach towards your left. You can park along the left side of the road towards the end of the lagoon, or you can keep driving straight to park in the parking lot at the end of the road.